One easy way to make your grocery dollar go farther is by doing some basic knife work in the kitchen. For example, why pay the store (or distributor) to cut up a chicken for you? The markup on chicken parts can be extreme. On a recent trip, my local chain grocer was selling local, free-range whole fryers for $1.79 per pound (on sale). The same brand of boneless, skinless breasts were $7.99 per pound, and thighs and legs were $2.69 and $2.49 per pound. “Drumettes” (the big part of the wing) were $2.89 per pound. I brought home a 4.72-pound bird ($8.45), cut it into parts, and weighed them (the results are summarized in a table below). Incredibly, the boneless, skinless breasts alone are worth more ($10.14) than the entire chicken at grocery-store prices! As discussed in a recent Culinate article and Dinner Guest Blog post, there are plenty of worthy uses for the other parts of the chicken, which you are essentially getting for free when you cut up your own bird. What allows stores to charge these markups? Are they cashing in on their customers' anxiety about cutting up the bird? It's really not very hard; if you're comfortable cooking a chicken, you can handle breaking one down, too. All you need is a halfway-decent knife and a cutting board that you can wash thoroughly afterwards (I use a dishwasher-safe composite board for raw proteins). A stiff or flexible boning knife is ideal for the task, but a chef's knife is fine if that's all you have. If you're not crazy about handling raw poultry, cheap latex gloves are an easy fix and are quite common in professional kitchens. 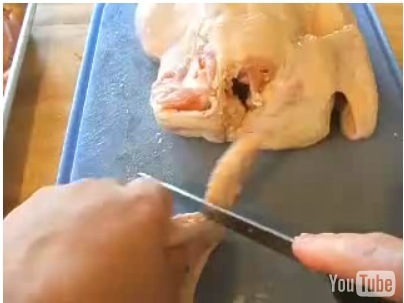 There is more than one way to cut up a bird; this video demonstrates my preferred method. The most important trick is to slide the knife cleanly through the center of the joints rather than cutting through any bones.